For some reason blogger wasn't allowing me to post until today. So sorry to be posting late! This month's challenge was a fabulous recipe -- a spectacular dessert consisting of several simple components when combined give an exquisite dish that is full of contrasting flavours and textures. Recipe Source: Emma and Jenny learned how to make this marquise dessert when they worked together at a Seattle restaurant. The recipe is adapted from one developed by Bennie Sata, a Seattle-area pastry chef who introduced the city to one of its iconic chocolate desserts. All vegan recipes were created by Ashlae of Ladycakes. Blog-checking lines: The May 2011 Daring Bakers’ challenge was hosted by Emma of CookCraftGrow and Jenny of Purple House Dirt. They chose to challenge everyone to make a Chocolate Marquise. The inspiration for this recipe comes from a dessert they prepared at a restaurant in Seattle. 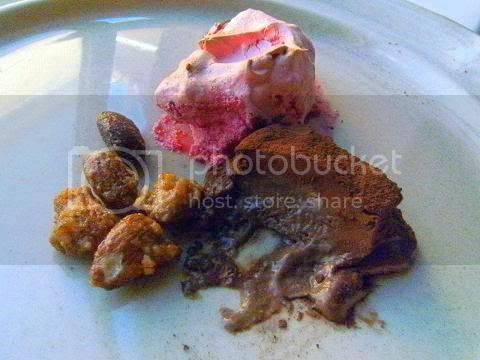 When I saw this challenge I was taken aback a little, I have never seen anything like this before, a cold soft spicy chocolate Swiss meringue 'sayabon' that can be cut into perfectly shaped cubes coated in Dutch processed cocoa powder served with torched French meringue all served with spicy flavoured nuts. So many different and intriguing techniques in one challenge which I always find inspiring. I went down to Melbourne for business for a couple of days so I couldn't do the challenge until yesterday night. I knew instantly what I wanted to do make a Moroccan version using harissa and mint in the marquise and a combination of ras el hanout and Dutch processed cocoa powder as the coating for the cubes of yumminess. I really adore spices with cocoa so I knew that a wide array of hot flavoursome spices and herbs would be perfect with this recipe. 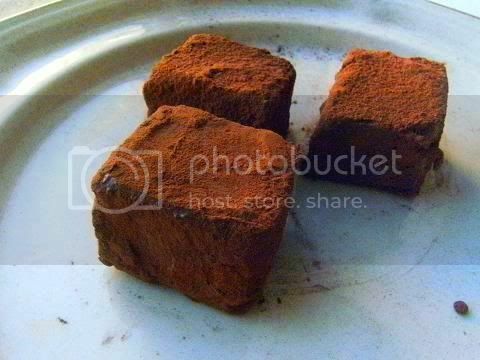 It surprises most people to learn that cocoa is a bitter spice that is perfect with chilli. In Mexico cocoa is included in a lot of savour spice mixtures. 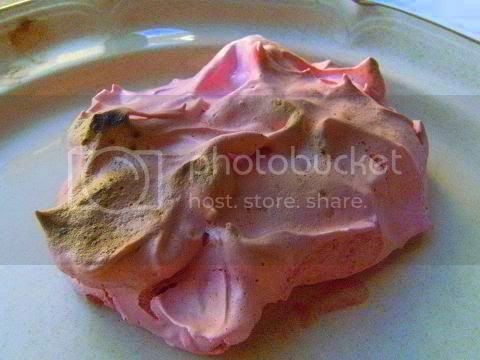 Since Moroccan spices go so well with red berries I flavoured the torched meringue with strained raspberry coulis. The Australian herb lemon myrtle pairs well with chocolate, raspberry and spicy flavours and I had a huge amount on hand so I made lemon myrtle nuts to serve with the dish. I made a gin caramel sauce since I thought gin would go well with all the other flavours and I had it to hand. Also I wanted to add some floral notes to the dish since rose water is widely used in Moroccan flavour profiles I placed a couple of drops of rose water and violet essence on the plate so the eaters could smell these powerful flower sensations in a controlled manner, since it is very easy to overwhelm a dish with rose water or violet essence I thought a couple of drops on the plate would be the best way to enjoy the perfume of flowers with the dish. I made the base with mint chocolate also I used home made harissa paste instead of the challenge recipe spice mix, I found the harissa goes perfectly with this marquise recipe since its piquancy, heat, flavoursome spices, tasty herbs and slight garlic taste (!) 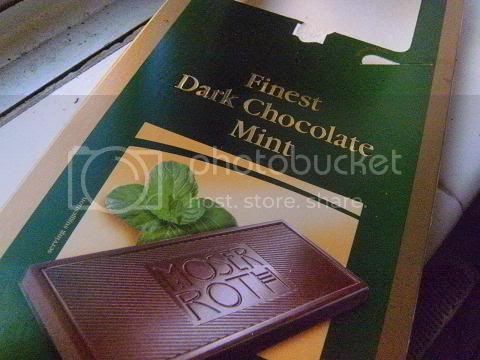 are a wonderful foil against the savoury mint chocolate base. The recipe is fairly simple but I found plating the marquise a bit fiddly since the coating is easily disturbed. It took so long to plate the final dish for photographs I forgot to add the gin caramel sauce, I found it in the pan after I had eaten the plated recipe oops and it's too dark now to redo the photograph. I made a half batch it will serve over 20 people I reckon since the marquise is extremely rich, flavoursome and filling. Making the 'sayabon' (Swiss meringue) takes about 25 minutes! it is a gorgeous process and so interesting to see how the texture and volume changes while doing it. The verdict – I loved the marquise and the torched meringue, the textures are very similar yet the richness and flavours are diametrically opposed; the marquise (rich and soft in mouth feel, spicy and piquant in flavour) the meringue (light and soft in mouth feel, mild and fruity in flavour). The spicy nuts (are so more-ish I had a hard time not eating them before the photography) are a great contrast to the marquise and torched meringue I really liked the lemon myrtle against the mint and chilli in the marquise. Also the flower aromas were a nice touch to whet the appetite for the Moroccan flavour profiles in the marquise and torched meringue. The over-all taste profile is rich chocolate, mint, raspberry, chilli, lemon myrtle and then an array of toothsome spices. Oh and the mouth feels are exquisite the marquise and torched meringue have very similar textures but are so different in tactile sensations which makes eating the dessert so delightful. Next time I would use individual serving dishes for the marquise or serve it as one large portion and cut it at the table or let my guests help themselves. 2. Do a practice run at making the sugar syrup (especially if this is your first time making it) so you can get the timing correct and see how thick and bubbly it looks like when it is the correct temperature. Make a note of the time needed and make sure you use the same heat setting for the recipe batch. 3. 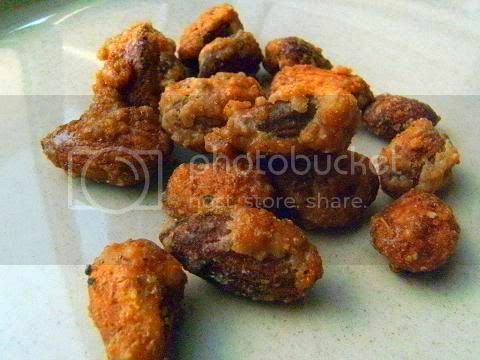 Make the nuts they can be be reheated easily if needed. Store in an airtight container. 4. Whip the cream to soft peaks do not overbeat and place it in the refrigerator. 5. 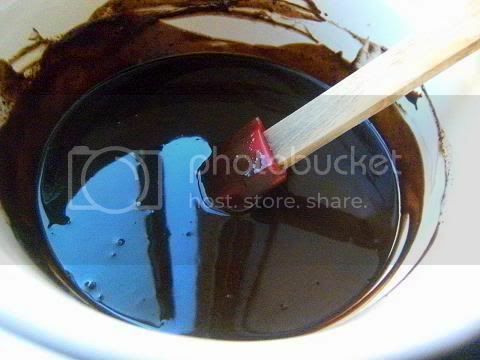 Make the chocolate base and leave it to cool when doing the other steps of the recipe. It takes a while to cool. 6. Then make the Swiss meringue. It does take 15 minutes to whip the yolks and whole eggs to obtain maximum volume, I found that the mixture increases about three times in volume. 7. While you are whipping the yolks and whole eggs for the first 15 minutes make the sugar syrup. 8. After you add the hot sugar syrup you need another 10 minutes to incorporate it into the whipped Swiss meringue mixture also it increases in volume by about 10% or so. I found the hot sugar syrup didn't really heat the whipped egg mixture or bowl very much just enough to warm it slightly. 9. When you add the chocolate base (ganache) to the Swiss meringue it falls to the bottom of the meringue you will need to fold it well to combine it evenly. 10. Add the cream in stages folding gently. 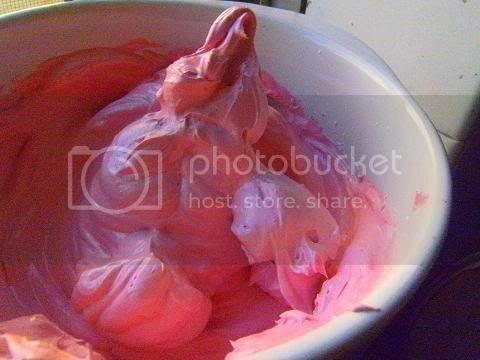 Must sure you whip the cream to soft peaks only if you go to firm peaks it will make the texture of the final marquise rough and the cream will be hard to incorporate into the whipped egg mixture. 11. When you fold in the cream you will loose some volume maybe 5-10%. 12. Remember to taste the marquise mixture and adjust as necessary, most people forget this most vital step. 13. The final marquise mixture looks smooth and glossy like a tranquil pool of deliciousness. It solidifies quickly in the freezer and the gloss stays even when frozen so lovely. 14. The marquise cuts beautifully into perfect shapes with clean edges. But it is very fiddly to transfer to the final plate and the cocoa coating will fall off in places and fingers will leave marks. Use toothpicks or a special flat spatula to move the marquise cubes. Do the cutting and coating while the marquise is semi-frozen then plate and place into the fridge. I found it doesn't melt unless it stays close to a heat source like your warm fingers or the warm torched meringue, Once the marquise is at room temperature you cannot really move it since it is soft but it will hold its shape if left alone. 15. 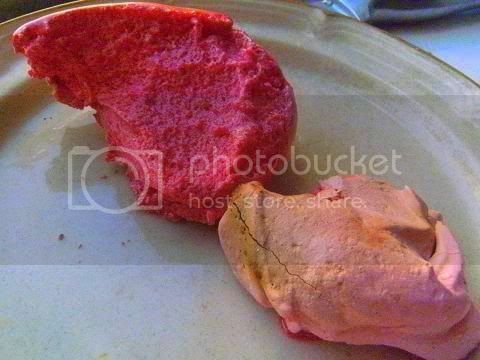 You can easily flavour the torched meringue with coulis, or flavoured jelly (jello) crystals. If you are using the broiler (grill) to torch the meringue place a tablespoon or so of the meringue onto lightly oil-sprayed aluminium foil broil (grill) at medium heat and watch carefully it is easy to burn them, use a spatula to transfer the torched meringue to the final plating dish. 16. I used 2 tablespoons of harissa paste and 2 teaspoons of extra chilli paste to spice up the marquise, this gave a nice punch to the taste of the final dish. 17. 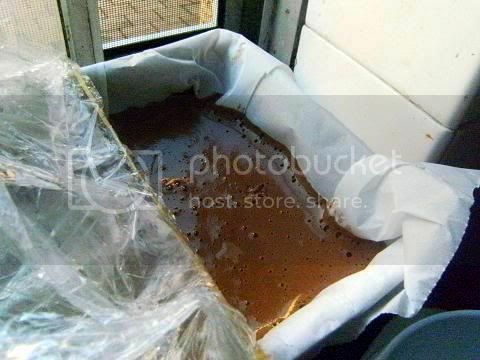 For the coating I did a ratio of 10:1 cocoa:ras el hanout (by volume). 18. Make the caramel after you have plated the marquise and the meringue. 19. Add the nuts and nibs and then add the caramel. 20. I made a gin caramel sauce. I forgot to plate it in the photographs. 1. Heat the salt and seeds in a small pan until they become aromatic. 2. In a mortar and pestle grind all the ingredients to form a paste. Don't use a coffee grinder - a motor and pestle gives a unique taste and texture which a grinder cannot reproduce. “Ras el Hanout” ("top of the shop" ) is a spice mixture from Morocco that can contain anywhere from 10-100 different spices. There is no definitive set combination of spices that makes up Ras el hanout. Each shop, company, person have their own secret combination containing over a dozen spices. Typically they would include cardamom, clove, cinnamon, ground chili peppers, coriander, cumin, nutmeg, peppercorn, and turmeric. Ah Audax, I'm so glad it was only blogger acting up. Was starting to worry a bit about you when I didn't see your post up. 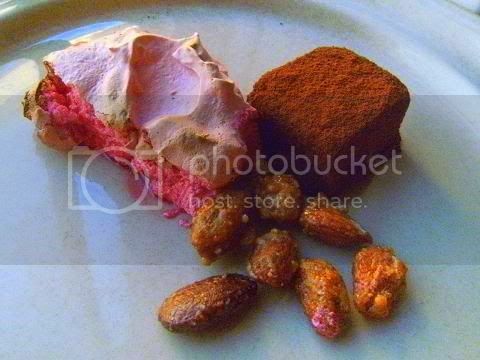 Your mint marquise looks and sounds delicious and the raspberry meringue is really beautiful! LOVE the color. Plus raspberry and chocolate are always a winning combination! 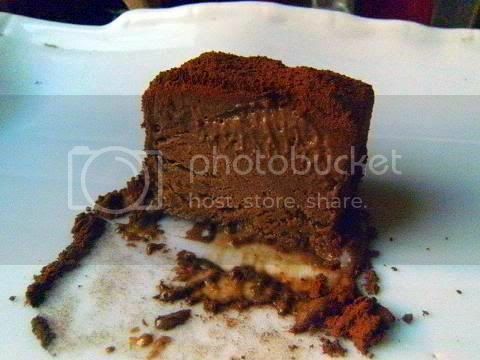 The plating was tricky without disturbing the cocoa powder but, of course, yours turned out perfect! Really glad it is just blogger..I was worried that something bad happened to you or someone close to you..
As always you did a magnificent job,I will definitely have to try your mint marquise soon. P.S. thank you so much for the half recipe...if you had not posted that I think I might have skipped the challenge this month.. I was surprised when I didn't see your post. Especially since you've been so helpful in the forums with this recipe. As usual great job on this challenge! Great job! and thanks for all the help on the DB forum! Audax, this challenge wouldn't have been the success it was without your scaling down those recipes to half and quarter size. I can't thank you enough for that - it really made a difference! And I cheer you on these flavors. You really went with it...we had very few DBers who veered into that adventurous a palate, but the ras el hanout? Inspired, I tell you. Thank you so much for participating this month. You made it all worthwhile! PS - I was looking at wikipedia and lemon myrtle is in the verbena family. Is this what we would call lemon verbena? Or are they two different herbs? Do you have photos of your myrtle? Thanks for the scaled-down recipes, and for all your help throughout the challenge. You always make my taste-buds sooooo curious! Yum, chocolate mint and raspberry meringue! Looks so delicious! Looks delicious! I love that you really did something original. I'm pretty late commenting here, sorry, I thought I had done so. As always, you have done an amazing job, not only with your amazing creations but also with all the support you have given to all of us. Thank you so much!